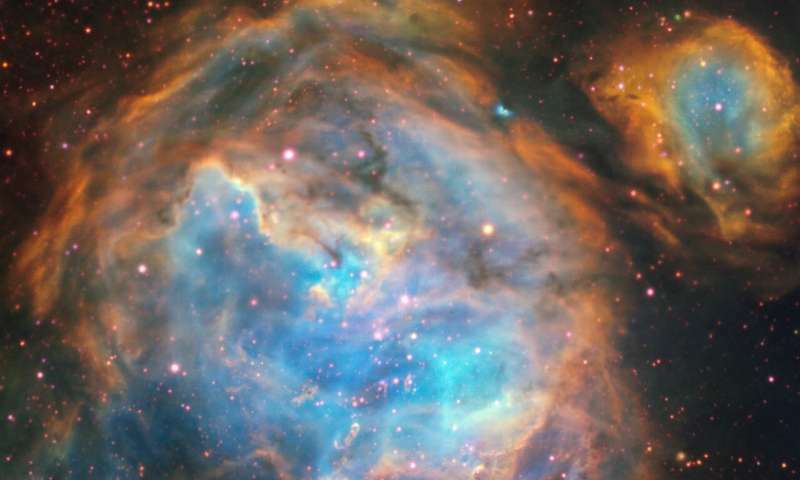 This dazzling region of newly forming stars in the Large Magellanic Cloud (LMC) was captured by the Multi Unit Spectroscopic Explorer instrument on ESO's Very Large Telescope. The relatively small amount of dust in the LMC and MUSE's acute vision allowed intricate details of the region to be picked out in visible light. Credit: ESO, A McLeod et al. This region of the Large Magellanic Cloud (LMC) glows in striking colours in this image captured by the Multi Unit Spectroscopic Explorer (MUSE) instrument on ESO's Very Large Telescope (VLT). The region, known as LHA 120-N 180B—N180 B for short—is a type of nebula known as an H II region (pronounced "H two"), and is a fertile source of new stars. H II regions are interstellar clouds of ionised hydrogen—the bare nuclei of hydrogen atoms. These regions are stellar nurseries—and the newly formed massive stars are responsible for the ionisation of the surrounding gas, which makes for a spectacular sight. N180 B's distinctive shape is made up of a gargantuan bubble of ionised hydrogen surrounded by four smaller bubbles. Deep within this glowing cloud, MUSE has spotted a jet emitted by a fledgling star—a massive young stellar object with a mass 12 times greater than our Sun. The jet—named Herbig-Haro 1177, or HH 1177 for short—is shown in detail in this accompanying image. This is the first time such a jet has been observed in visible light outside the Milky Way, as they are usually obscured by their dusty surroundings. However, the relatively dust-free environment of the LMC allows HH 1177 to be observed at visible wavelengths. At nearly 33 light-years in length, it is one of the longest such jets ever observed. HH 1177 tells us about the early lives of stars. The beam is highly collimated; it barely spreads out as it travels. Jets like this are associated with the accretion discs of their star, and can shed light on how fledgling stars gather matter. Astronomers have found that both high- and low-mass stars launch collimated jets like HH 1177 via similar mechanisms—hinting that massive stars can form in the same way as their low-mass counterparts. MUSE has recently been vastly improved by the addition of the Adaptive Optics Facility, the Wide Field Mode of which saw first light in 2017. Adaptive optics is the process by which ESO's telescopes compensate for the blurring effects of the atmosphere—turning twinkling stars into sharp, high-resolution images. Since obtaining these data, the addition of the Narrow Field Mode, has given MUSE vision nearly as sharp as that of the NASA/ESA Hubble Space Telescope—giving it the potential to explore the Universe in greater detail than ever before. This research was presented in a paper entitled "An optical parsec-scale jet from a massive young star in the Large Magellanic Cloud" which appeared in the journal Nature.